Lindsey here! Since my last writing, I have been in eleven states. Mom and Dad still keep moving my home on wheels. They say full time RV living for them involves traveling and working in multiple locations in order to grow their business. I don’t know what that means but I do get to leave p-mail in a lot of different states. Things have improved on the computer usage issue. Dad bought another HP laptop computer, with Windows 10, so now there are three laptops around. I guess humans like to look out the window too and that’s why Dad spends so much time in front of the computer. Dad wanted to get rid of the oldest one but I grabbed it and now have one that I can use to write my blog posts. 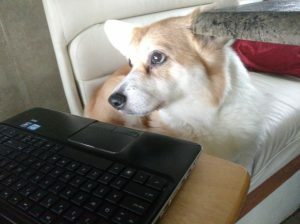 With my big paws, I can’t type very well, but I am getting better at it. I was able to change the fonts sizes on the screen so I can see things a lot easier given my failing eye site! I will be thirteen human years old next month. That makes me at least ninety-one in doggy years. I spent a few weeks in Mesa, AZ where it was hot and there was absolutely no grass to pee on! It is nothing but gravel, palm trees, and cactus. Mom and Dad were busy spending time with other people who live in RV’s talking about technical stuff that makes no sense to me. But they seem to enjoy it! From there we left to head to a place called California. I was there when I was a puppy, but I don’t remember that much during that RV trip. Anyway, we did get a chance to do a little sightseeing on the way there. 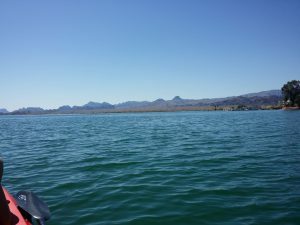 We stopped in a place called Lake Havasu. This place was a little better than Mesa. At least there was a big lake and a little more grass. We stayed in an RV park near town. 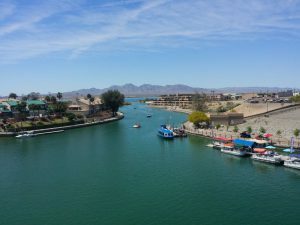 Mom and Dad were gone quite a bit going to see this thing called the London Bridge and the sites of Lake Havasu City. They even rented a Hobie kayak and paddled around the bridge and lake. I couldn’t go because it interrupted my nap time. After a few days there we headed to Bakersfield, California for another session of classes that Dad was teaching. It was really hot there! One day it hit one hundred and three degrees. I nearly burned my puppy paws on the gravel and asphalt. We were there for a few weeks and then we got to leave. The RV park was in the middle of orange groves and there was not much else around. So, between the heat and that, I was ready to move on! From there Mom and Dad said we were headed to a much cooler place, and that it rained a lot too. We traveled north to a place I had never heard of. After leaving California we were in a state called Oregon. It did get much cooler and rainy. One day it was in the forties, whatever that means. All I know is that I was glad to have my heavy fur coat. After spending a few weeks with more nice people in both Salem and Jefferson, Oregon, we took a long drive to Colorado where Mom, Dan and I used to live. We were only a couple of hours from where my “stick and bricks” home used to be. We came across the central part of Colorado on Hwy 50. We had to cross a mountain pass called Monarch Pass. We climbed over 10,000 feet and found snow from a late season snow storm. Dad took a picture of the RV there. We ventured on and stayed a week in a town called Canon City. Mom and Dad spent time with more RVers, some that are also enjoying the full time RV lifestyle, talking about the advantages of operating a small business out of their RV home. Some of them decided to take Dad’s advanced RV inspection training class the next week in Pueblo, Colorado. But before leaving Canon City Mom and Dad were able to do a little sightseeing. 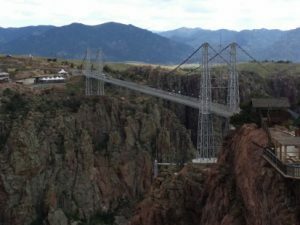 They visited a place called the Royal Gorge Bridge Park. They do allow dogs there, and I could have gone except that given my age I am not able to really take long walks like I used to. 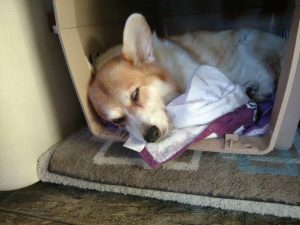 So I stayed in the RV and took a nap. I heard Mom and Dad talking about it. They said it was really a beautiful place! They took lots of pictures of the Colorado landscape. I included some of them here. After some boondocking nights around Colorado Springs, Mom said we needed to leave the state and head to Indiana. Now I have been there before. I was there a couple of years ago when Mom and Dad were there for factory tours and teaching engagements. So now we are in Shipshewana in what I have heard Mom call Amish country. There are a lot of horses here and people riding around in buggies, or what some call carriages. Some of the people here don’t have cars. They choose a more traditional lifestyle. They seem to love to make baked goods and country style cooking. Mom and Dad seem to like it! We’ll be here for a bit while Mom and Dad conduct more of their business activities. I have had a chance to meet some big furry beasts that are in the field behind our RV home. I think they are also horses, but I have never seen ones this big, I barked at Mom and she said they are draft horses. Well, that’s all for now. I’ll bark again soon! It’s time for a nap. I wore myself out remembering all the places I have recently been. Don’t Wait for Service, Learn How to Fix it Yourself!